With the Centers for Disease Control and Prevention reporting that a typical flu season costs an estimated $7 billion in sick days and lost productivity, the workplace is often “ground zero” for contamination, according to the Business Wire. 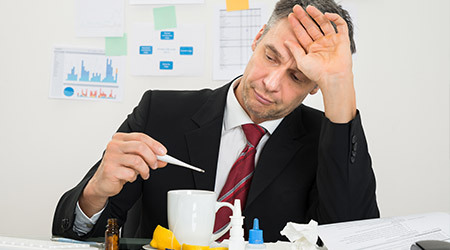 “The workplace can be a hotbed for influenza germs. Common areas, break rooms, restrooms, conference rooms, elevator buttons and shared tools can be contaminated with the flu virus. If one person is infected, then they can potentially put the rest of their workplace at risk, even through indirect contact,” said Steve Zimmerman, director of healthcare services for ServiceMaster Clean. • Encourage employees to frequently wash their hands with disinfecting soap. Also provide plenty of alcohol-based hand sanitizer. • Wipe down “high touch areas” with disinfecting wipes at least once a day. High-touch areas would include break room surfaces, conference room tables and chairs, doorknobs, restroom fixtures, light switches and tools that are used by multiple people. • Let employees know that they should stay home if they have flu-like symptoms, otherwise they put the health of the entire team at risk. Managers, watch for signs that an employee isn’t feeling well, and don’t be afraid to ask them to go home for the day if needed. • Make sure everyone has flu-fighting supplies at their desk: tissues, hand sanitizer, and disinfecting wipes, at a minimum.